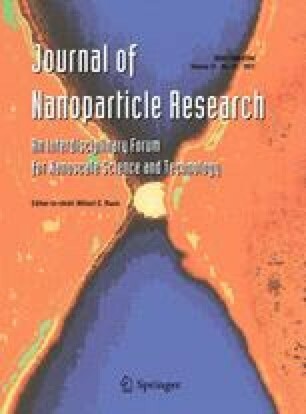 The antibacterial activities of magnesium oxide nanoparticles (MgO NP) alone or in combination with other antimicrobials (nisin and ZnO NP) against Escherichia coli O157:H7 and Salmonella Stanley were investigated. The results show that MgO NP have strong bactericidal activity against the pathogens, achieving more than 7 log reductions in bacterial counts. The antibacterial activity of MgO NP increased as the concentrations of MgO increased. A synergistic effect of MgO in combination with nisin was observed as well. However, the addition of ZnO NP to MgO NP did not enhance the antibacterial activity of MgO against both pathogens. Scanning electron microscopy was used to characterize the morphological changes of E. coli O157:H7 before and after antimicrobial treatments. It was revealed that MgO NP treatments distort and damage the cell membrane, resulting in a leakage of intracellular contents and eventually the death of bacterial cells. These results suggest that MgO NP alone or in combination with nisin could potentially be used as an effective antibacterial agent to enhance food safety. The authors wish to thank Anita Parameswaran and Gaoping Bao for technical support. We would also like to thank our reviewers, Drs. Joshua Gurtler and Dike Ukuku for careful critiques.